My hand tool journey with Popular Woodworking, from Don Weber on the cover, through learning from people like Roy Underhill, to teaching for Popular Woodworking University. The 2015 Lie-Nielsen Summer Open House will be July 10-11 at the Lie-Nielsen Toolworks in Warren, ME. This is a free event open to all, a great opportunity to see behind the scenes, try all their tools, and meet a bunch of great woodworkers. The list of guest demonstrators is headed by the superb Roy Underhill, host of The Woodwright's Shop on PBS, one of my woodworking heroes. 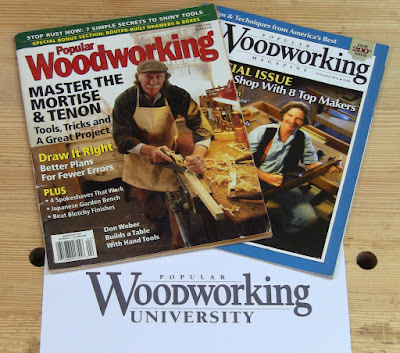 I'm honored to be representing Popular Woodworking Magazine at the Open House, not as an employee, but as an instructor for their online Popular Woodworking University. Look for the PW banner, say hello, and join me making some shavings! My new PWU course Intro To Hand Tools starts July 15; registration is currently open. On the registration page you can watch a 3-minute introductory video. The cost is $59. In nearly 40 short online videos, I cover a wide range of beginning hand tool skills to give you a solid foundation. "Fistfights And Fundamentals" segments help sort out the various arguments about different ways of doing things. You can watch a free lesson below from Popular Woodworking's YouTube channel: Long Grain Rabbets (2 methods: chisel, and moving fillister plane). The full course includes 5 additional ways to do this. Whether you're a first-time beginner with the barest set of tools, or already have some skills and a more extensive set, you should be able to find something here. If you'd like to see the full range of topics covered in the course, you can watch my trade show trailer below that I'll have running on a TV at the Open House. It's silent to avoid disturbing other exhibitors and demonstrators, but it shows a montage of short snippets from the entire course. And if you'd like some suggestions for expanding your set of tools while at the Open House, I'll have a complete list of all the tools appearing in the course, from anonymous antique to modern high quality premium brand name. It's fitting that I'll be representing PW, because the magazine has been key to my development as a hand tool woodworker. Don Weber's cover story in the April, 2004 issue led me down the garden path. From there, then-editor Christopher Schwarz's articles, books, and videos gave me the background to start understanding what Roy and others were doing. Then it was just a small matter of making shavings to develop the skills!